Sita Thakurani was the wife of Sri Advaita Acharya. She was always absorbed in parental love for Lord Chaitanya Mahaprabhu. Because of Sita Devi's love, Sachi Mata, Lord Chaitanya's mother, often chose her as the first person to worship Lord Chaitanya during any auspicious ceremony. 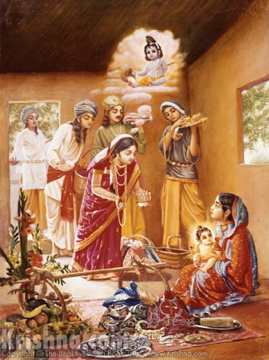 Image at right shows Sitadevi, the wife of Advaita Acharya, visiting Lord Chaitanya and His mother Sachi.